Lexington, MA, November 13, 2015 – Daymark Solutions, a leading integration and solutions provider of information technology in New England, announced that it has been honored by The Channel Company with the esteemed 2015 CRN® Triple Crown Award. Fewer than 60 North American solution providers, and only 5 from New England, had the necessary revenue, growth and technical expertise to be recognized on three of CRN’s preeminent solution provider lists, earning them the Triple Crown Award this year. It is a considerable achievement for a solution provider to make any one of these lists. 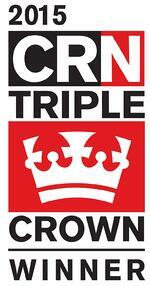 To make it onto all three, however - as this year's Triple Crown Award winners have done - a company must simultaneously have enough revenue to be ranked on the Solution Provider 500 list, record double- or triple-digit growth for recognition on the Fast Growth 150, and invest heavily in top certifications to attain Tech Elite 250 status.